Well, but then there are probably genetic crosses to Garth Nix, Diana Wynne Jones, Brandon Sanderson, Ransom Riggs, and others. Stop trying to imagine what that would look like! (Sheesh.) Jacobs is a witty, irreverent, vocabulary-spewing, pop-reference popping wordplayer that makes Casper and Jasper and the Terrible Tyrant as much for adults as it is for kids. 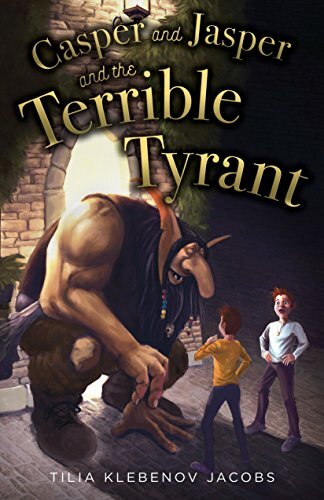 In between puns and peril, there’s a frenetically fast fantasy adventure story starring a pair of red-headed boys (who I kept picturing as Fred and George Weasley), two sets of parents, a terrible ice-addicted tyrant, fidelius birds, and a plethora of oddball characters, including a drunk car. The book would seem like too much of an homage to great literature and classic children’s tales, but it totally triumphs on its own merits. Loved, loved, loved this book! Adele and Zach and their fellow revolutionaries are plotting against a micro-managing tyrant when they are betrayed. As Adele and Kale are forced into the paddy wagon, they turn and throw their twin baby boys into the crowd, where the boys are caught by total strangers, Becky and Zack. Uncle Zack and Aunt Becky raise the boys while Adele and Kale spend year after year slaving in forced labor camps. 12 years have passed and revolution is fomenting again. It’s about time that someone stood up to the tyrant, who has underestimated the power of a family. If you love fantasy, brilliant children’s stories, witty banter, and word play, Casper and Jasper and the Terrible Tyrant has your number. I don’t think you can pin this book down to middle-school or any age, as I think adults and even high schoolers will get a kick out of the wit, action, and humor that races its way through this adrenaline-laced adventure. Highly recommended. Casper and Jasper are fast-talking, twelve-year-old twins who discover that their parents, long believed dead, are in fact rebels being held by the evil Count Wilhelm Scream. When the boys set out to rescue their parents, they stumble into a land of werewolves, trolls, and carnivorous marshmallows. Will the twins’ loyalty and quick wits be enough to save their parents – and themselves?